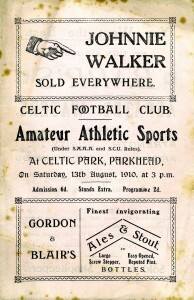 By 1911, the Celtic Sports was one of the biggest meetings in the country and the second Saturday in August was the date. Coming as it did one week after the Rangers FC Sports, it completed a week of top class sporting action in the city with tens of thousands attending the Saturday meetings. Both clubs put on Monday ‘supplementary’ meetings too which regularly attracted 5000-8000 a time. 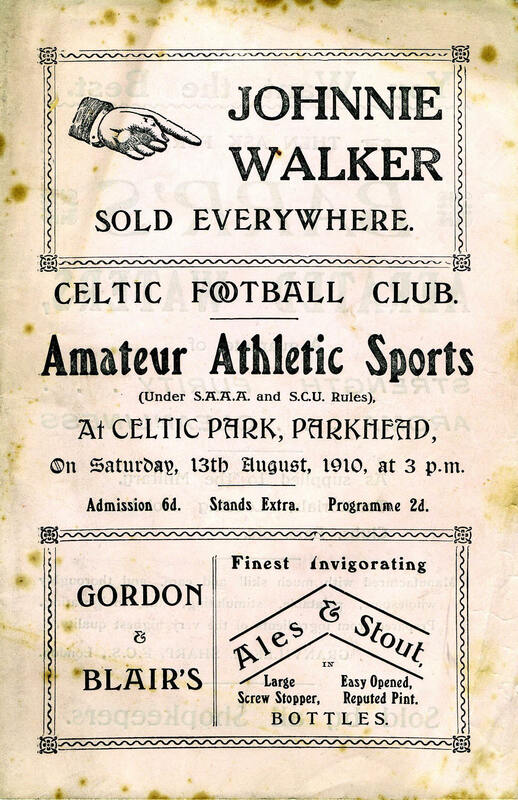 In 1911 the Celtic FC Sports meeting was held on 14th August. It was a huge success. Even the ‘Glasgow Herald’ reporter had difficulties toning down his exuberance as he wrote of it. 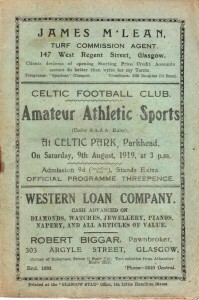 “Besides FL Ramsdell, HE Gissing and JJ Flanagan of America, several distinguished English athletes and cyclists took part in the annual sports of Celtic FC at Parkhead on Saturday and, as a consequence, competition in many events was very much above the average of what is usually witnessed in the city, celebrated as it is for its rare sporting associations. The Celtic management spare neither money nor time in connection with their sports, and this season by way of celebrating an interesting epoch in their history, they extended more invitations than they usually do, with the result that Saturday’s meeting in many respects will hold a cherished position in the club’s records. Large as the attendance was, it it would have been larger still but for the tramway strike. As it was, the official estimate was 30,000. 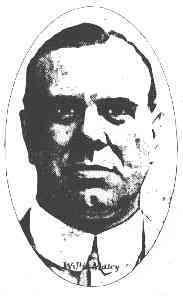 The arrangements of Mr Maley were in advance of anything previously witnessed at Parkhead, and when we mention that over and above football there were 53 different events all of which were disposed of in three hours and a half, it will be admitted that there has been nothing better in the way of athletics management seen in the city. Every item was so rapidly dealt with that there was scarcely any time for reflection. Harry Gissing was a member of the Irish-American Athletic Club of New York and a noted middle distance runner, Ramsdell was a sprinter from the University of Pennsylvania and Cornell and JJ Flanagan was an Olympic record breaking hammer thrower who won three Olympic gold medals, the first of these being in 1900. At Parkhead Flanagan was second in the handicap hammer thgrow to Scotland’s T Nicolson who had a 10′ handicap allowance. But the Americans were indeed as good as the reporter from the ‘Herald’ said they were. The comments on Willie Maley’s management skills are interesting but not really surprising. He had been involved in the sport since the early 1890’s with Clydesdale Harriers, was now on the SAAA Committee where he would later be tasked with leading a post-war committee on the re-establishment of the sport after the 1914-18 war. 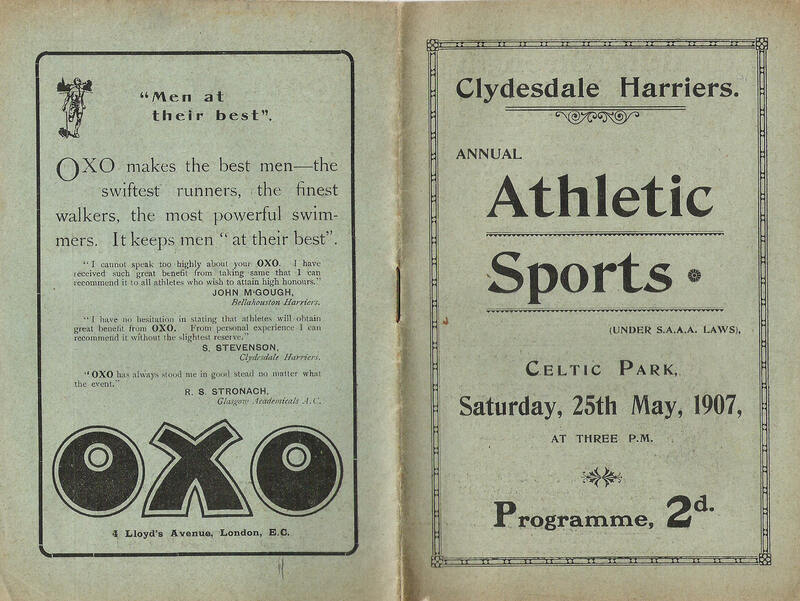 In addition both Ibrox and Parkhead were used for several sports meetings every summer – some by clubs such as Clydesdale Harriers (who favoured Ibrox but also used Parkhead ), Shettleston Harriers (who favoured Parkhead), West of Scotland Harriers (who moved from one ground to another depending on when they held their meetings), and some by a variety of public services such as Glasgow Transport (who favoured Helenvale), Glasgow Police (who favoured Ibrox) and Lanarkshire Police who latterly went to Shawfield). The result was that the groundsmen became expert in getting the impedimenta associated with every event on and off with minimum fuss, the organisers had good connections with the governing bodies and athletic clubs and there was generally a high level of expertise at all clubs. Possibly higher than at some specialist venues in the twenty first century. 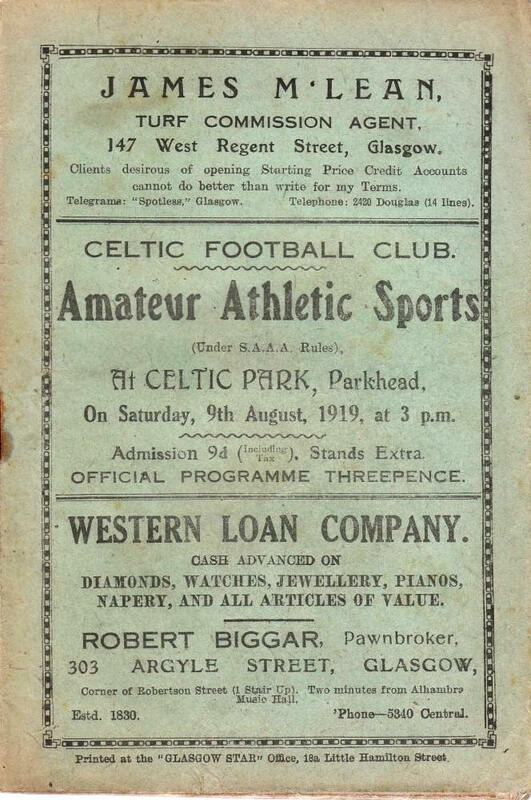 If 1911 was good, 1912 was better with an estimated 40,000 spectators at Parkhead on a sunny and warm afternoon to see even more American and English athletes in action. The half-mile scratch race was won by America’s Melvin Sheppard (Irish American Club) from Germany’s Braun with JE Meredith of the American Olympic team third, but only in a time of 1:58 – in a refrain that was familiar over the years, not as fast as he had done at Ibrox the previous Saturday. Hardly surprising at the end of a long season with two races the week before. The race was said to be disappointing with Meredith dropping out with 200 yards to go. The Mile was won by Ireland’s R Hales of Donore Harriers in 4 min 24 4-5th sec and WR Lippincott of the American Olymnpic team was third in the invitation 220 yards handicap behind Hawich RFC wing three-quarter WR Sutherland of Teviotdale Harriers (8 yards) and RC Duncan of West of Scotland Harriers. The meeting on Tuesday promised a very good 1000 yards invitation with Sheppard, Braun and Meredith, all off scratch, George Dallas Maryhill Harriers) and Sam S Watt (Clydesdale Harriers) off 38 yards, in a field of 38 entries. There were also invitation races at 100 yards and two miles. As it happened all three scratch men ran in the 1000 yards but were unplaced with the winner being L Littler (Bellahouston) off 80 yards from JB Thomson of West of Scotland off 95 yards. Part of the explanation might lie in the fact that they Olympians all ran in a scratch invitation 440 yards with Sheppard winning in 51 4-5th seconds. There were two five-a-side tournaments, Rangers defeated Airdrieonians in the Senior final and Petershill beat Shettleston in the Junior 5-a-sides. The motor cycles were also in action as were pedal cycles. The crowd was estimated at 5000. 1913 was the year Willie Applegarth set a Scottish 100 yards record at Ibrox and then broke the 220 yards record at Parkhead seven days later! Applegarth was one of the best sprinters in the world and ran in the 1912 Olympic 100 metres, 200 metres and as a member of the GB 4 x 100 relay team and in the process won bronze in the 200m and gold in the relay. A year later he was racing in Glasgow so he was probably at his best. He turned pro in 1914 and emigrated to the USA in 1922. But it was a real coup for Rangers FC and Celtic FC to have such a runner at their meetings. This probably contributed to the 36,000 who turned up to spectate. The record was discussed first. “A new Scottish record at 220 yards was created by WR Applegarth, who, it will be remembered, broke the 100 yards record at Ibrox the previous Saturday. The new time for the distance was accomplished in the seventh heat of the open handicap at the distance. Applegarth was on scratch, conceding starts up to 25 yards. He ran strongly all the way just overtaking in the last two yards T McAllister the winner of the two sprints at the Rangers Sports who had 18 yards. Applegarth’s time was 22 seconds, or one fifth better than the record established by DF Lippincott at Ibrox last August.” Applegarth also ran in the 120 yards off scratch but finished second, and in the 220 final he caught his foot on the inside of the bend, failed to recover and finished out of the prizes. In the distance races, the three miles handicap was won by England’s E Glover from Ireland’s P Flynn and A Loch of Clydesdale Harriers in third. Loch also won the handicap mile and George Dallas won the invitation 500 yards. August 15th, 1914, was the date for the last big amateur meeting in Scotland before the declaration of war. At Parkhead, for that is where it was held, there was yet another American to add to those seen in recent years: Homer Baker. Baker was the US half-mile champion in 1913 and 1914 and toured Europe in 1914, winning the AAA’s title from Albert Hill. He ad a best time of 1:56..4 and held the world best for 660 yards of 1:20.4 for 26 years. It was however impossible to get away from the what which was inevitable and the column which had the above report on Baker had this a bit further down. Many clubs from all sports also made donations of money and all had members serving in the forces. It is worth bearing these circumstances in mind when reading about the various athletic meetings up to 1918. The freedom of American to come and go at this time when their country was not involved in the war is also noted. Sporting bodies are contributing munificently to the various war funds. First and foremost up to the present is the Scottish Football Association’s £1000 with the promise of more if required; an excellent second is the Scottish Football Union with £500. The Celtic, true to one of the fundamental principles on which the club was established, contributes £100 and the MCC, the fountain head of cricket, has has given £250 to the Prince of Wales’s Fund. 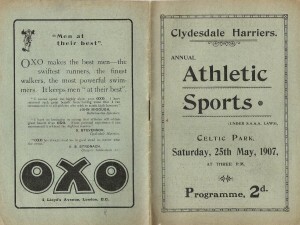 These examples are expected to be widely followed during the present week: – Several of the Glasgow Academicals have joined Lord Tullibardine’s new force – Mobilisation of the Territorials prevented WF Taylor, President of the Bellahouston Harriers; JM Taylor of the West of Scotland Harriers, and others taking part in the recent sports of the Celtic FC; – WR Applegarth was a Territorial but resigned last summer, it is just possible he may rejoin his old regiment; – it is stated that no fewer than 600 applications have been received by Cambridge Officers Territorial Corps, and that headquarters have been opened at Corpus Christi College. Students who have been prominently identified with sports of the ‘Varsity, especially rowing, are predominant among the applicants; – Colonel JD Boswell, an ex-President of the Scottish Football Union, is with the Ayrshire Yeomanry; – T Barrie Erskine, Clydesdale Harriers is proceeding immediately to join the Officers Special Reserve on active service, and his brother Ralph, the ex-amateur lightweight champion, will also join the forces; – the Open Amateur Golf Championship of Irelandwhich was to have been held at Portrush in the first weekend in September has been abandoned owing to the crisis; – WR Milligan, who has been at the head of the Rugby reformers in the district, has re-enlisted with the 5th Scottish Rifles; – It has been suggested that in the event of the receipts of the League clubs falling off to the extent anticipated, the professionals should assist to ease the situation by consenting to take reduced wages. – Ronald Cowan, who played several games for West of Scotland last season, has taken a commission in the 6th HLI, the head of which, Colonel Cochrane, is an old rugby footballer. Cowan’s military experience was gained at Merchiston as a cadet. – There is some anxiety at Derby with regard to S Bloomer, the English international “soccer” player, who went to Berlin as coach shortly before hostilities broke out. – Glasgow University is giving the flower of its athletic resources to the war. The following , among others, have volunteered through the Officers Training Corps for commissions. (a) in the Territorial Force for home defence; (b) in the Special Reserve of Officers, the latter to fill vacancies as they occur in the regular army:- Territorial Force – J Hood, J Andrew, J Millar (Rugby)A Kennedy (tennis), – Gilchrist (hockey); Special Reserve – WE Maitland, JN MacKay, FE Ferguson, TC Caldwell, HH Spencer (rugby), DM Hill (tennis), HT Alexander, MT Allen, P McQuaker, HEC Bacon, GH Davis (hockey). Dr Stanley Robertson has joined the Navy. JB Sweet of international Rugby fame, has also taken a commission in the reserve. On 14th August 1915, in front of a crowd of 18,000, it was a purely domestic field although there were several quality athletes in action including J Wilson who won the mile. The programme included flat handicaps at 100 yards, 220 yards, 440 yards, 880 yards and one mile plus a 100 yards for military personnel and an invitation military marathon race and a five-a-side tournament. “Fore the open events there were large entries, for the 100 yards being 52 and the furlong 50. Proceedings began with the half mile handicap, for which there was an entry of 37, but several of the entrants did not run. G Dallas (Maryhill Harriers), virtual scratch at 8 yards, was generally expected to win the race, but though he caught the field with 100 yards to go, he failed to finish at his usual pace, and was fourth at the tape. J Wilson, the Scottish four miles champion, competed in the mile, in which he showed a considerable improvement on his form throughout the season, winning winning by a yard in 4 min 28 sec. Six teams entered for the marathon race, which was run on the track, and resulted in an easy win for the for the first team of the 8th Provisional Battalion HLI. A very interesting report in lots of ways but the fact that the event was still going ahead during the hostilities and still attracting a crowd of that size must have been encouraging. A good meeting on a good day with a domestic field. In 1916, the crowd was again thought to be about 40,000, a programme of four events – 100, 220, 880 and Mile – was carried through along with the three ‘military only’ events but the report was vestigial. The country at large had other things to think of. On the athletic front, a sports meeting had been organised in 1915 and again in 1916 by Harland and Wolff at Ibrox in aid of local war funds. I couldn’t find the report of the 1917 meeting but in 1918, on 10th August, 30,000 spectators turned up for the meeting which had seven events, five-a-side football, a gymnastic display by the boys of Westhorn School and a parade by the bands of the Royal Scots Fusiliers which ‘blended pipes and brass’ plus a parade ‘symbolic of the Alliance against Germany.’ For all that the athletics ‘did not fail in attractiveness’, the report was scanty with the invitation 220 yards being the highlight of the afternoon.